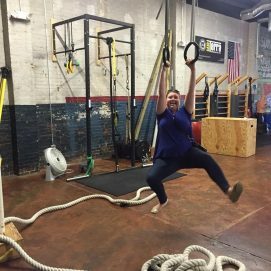 For seven years Original Strength Institute (previously known as OPT) has been thriving in Fuquay-Varina. Owners, Dani Almeyda and Tim Anderson, have been taking growth in strides- moving locations, rebranding, and building up a huge following within our community along the way. Today I sat down with Dani to learn more about Original Strength Institute. Dani always knew she was going to be in the health and fitness industry, attending school for Sports Management and Exercise Science. It was natural for Dani to move into an entrepreneurial role, she grew up in a family full of entrepreneurs. Dani shares with me some of her favorite parts of being a small business owner and beams when she shares of her passion for “forming relationships” with her clients and watching them reach their goals. Dani also enjoys working hard, but having the flexibility to spend time with her two young children. Trainers hear everyone’s deep dark confessions! Dani’s laughs when I asked her some of the funny confession stories she has heard over the years, “A client came in the other day and broke down to me “I had birthday cake for breakfast”! 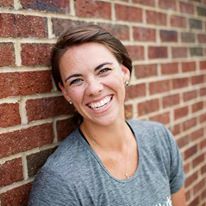 Dani laughs and tells me there is no need to apologize to your trainer if you eat cake, or skipped a workout, but says she could “write a book about the funny things” people have told her. It may come to a surprise to you that our community’s prized gym is also the sister company and headquarter location for an internationally known company, Original Strength. Original Strength educates other gyms, coaches, healthcare professionals, and physical therapists how to teach their clients/patients press reset and live their lives better! These programs are distributed and taught worldwide, Original Strength is a big deal! Tim has written several books and teaches movement to be able to live lives to the fullest extent – even into our 90’s! “Much like resetting an electronic device after its not working well, we can press reset on our bodies to help us feel better and move better” Dani tells me. Being able to spread the message that movement can heal and to help people lead healthy lives is important to Dani and Tim. OSI has been operating out of Downtown for years now, being a part of the Downtown family means the world to Dani and OSI “we love being a part of the community and getting others involved” she explains. Working with many Downtown businesses and supporting other businesses in Downtown is something OSI is energized about. When Original Strength hosts conferences in town you will often see Dani and Tim leading groups of people in and out of our Downtown businesses, showing off what makes our Downtown unique and charming. It is clear when you walk inside that Original Strength Institute is not your average gym. OSI hosts specialized ninja classes for kids, training classes for our towns 5k, self-defense classes, mommy and me classes, and much more- there is something for everyone! Dani tells me the plan is to expand their educational programing even more and expand the gym into other towns. We will be on the watch to see this great Downtown business and what they have in store for us next! Dani let me ask her some rapid fire questions as we finished our lunch! She ate WHAT?! Best place to escape in Downtown? Grossest food you’ve ever eaten? I ate a worm, I thought it was fake. I loved hanging with Dani! Interested in learning more? Check out Original Strength Institute online and on Facebook!